Nut butter lovers will find themselves in heaven at the Peanut Butter Bar, the world’s first and only peanut butter bar. The Peanut Butter Bar’s mission is to deliver indulgent wellness — decadent desserts that complement a restrictive diet. They even have peanut butter on tap. 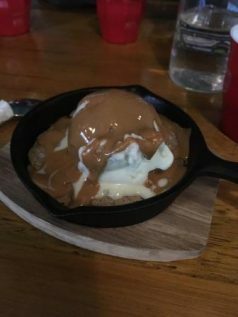 Although packed with delectable options, the must try menu item is the salted peanut butter & chocolate chip cookie served warm in a skillet topped with a scoop of their signature protein gelato. Other delights include the peanut butter tiramisu, peanut butter chocolate lava cake, protein pancakes and peanut butter loaded shakes.